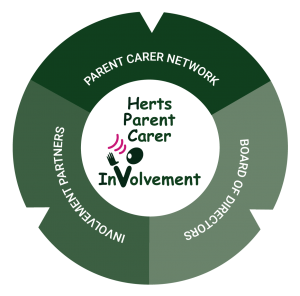 HPCI – Herts Parent Carer Involvement – is a parent carer forum recognised by the Department for Education, Hertfordshire County Council, Herts Valleys CCG and East & North Herts CCG as the parent carer forum for Hertfordshire. We began in 2010. A parent carer forum is a group of parents and carers of children with SEND (Special Educational Needs and/or disabilities) who work with education, health and social care services and providers to make sure the services they plan and deliver meet the needs of children/young people with SEND and their families. Parent Carer Forums are recognised in the SEND Code of Practice (CoP ref 1.13). Parent Carer Forums exist across England (not Wales or Scotland) and in almost all local authority areas. Over 82,000 parent carers belong to Parent Carer Forums. Parent Carer Forums are made up of parent carers with children and young people who have all types of SEND) from the local area. HPCI covers all of Hertfordshire. You can read more about these forums, how they work and the national picture for parent carer participation by going to Contact’s website. HPCI is a CIC (Community Interest Company) and as such is a not for profit organisation. As a Company we don’t have a Constitution but rather Articles of Association. We have a parent network of over 760 parent carers, a smaller group of around 30 parent carer representatives and an unpaid Board of Directors (internal link to Board of Directors page) who oversee the running of HPCI. We also organise Involvement Partners which is made up of representatives from interested SEND support/voluntary groups in Hertfordshire who we communicate with regularly and hold twice yearly meetings with. Children and young people aged 0-25 years with Special Educational Needs and Disabilities (SEND) reach their full potential and experience the same life choices as their peers who do not have SEND. HPCI is a parent carer led organisation which represents the views and experiences of families in order to influence the development and improvement of services for children and young people with Special Educational Needs and/or Disabilities (and their families) in Hertfordshire. To be the strategic body for parent carer involvement across health, education and social care in Hertfordshire. To be representative of parent carers covering all Special Educational Needs and Disabilities for children and young people aged 0-25 years in Hertfordshire. To increase membership, to encourage and support parent carers to be actively involved in Herts Parent Carer Involvement, and to train parent carers to represent others. To improve the impact of involvement through effective co-production with service providers. To continue to improve HPCI Board effectiveness and review all elements of the Organisation. To forge links with local parent networks in Hertfordshire and parent carer forums from neighbouring Local Authority areas, for mutual support and to share good practice. To encourage effective two-way communication and partnership working between parent carers and professionals. To link with parent carer forums regionally and nationally to influence, through partnership working and co-production, services and government bodies at regional and national level. HPCI receives funding from the Department of Education and Herts County Council. We do not have any premises. All board members and parent reps are based from home. The directors oversee the running of HPCI and meet approximately 8 times a year. The role of director is unpaid. You can find out more about HPCI’s directors here. As a parent carer forum, our parent network comes from a wide range of backgrounds and their children have a wide range of SEND. Parents in our network also have a range of views about services and our parent representatives work to reflect those views in the work they do. To help our reps in their role, HPCI has drawn up position statements and policies on a range of topics. These can be found here. HPCI is a member of the Eastern Region of Parent Carer Forums (ERPCF). The Eastern Region covers 11 forums covering Peterborough, Central Bedfordshire, Bedford Borough, Luton, Hertfordshire, Cambridge, Suffolk, Norfolk, Southend, Essex and Thurrock. Two representatives from each forum meet 3 times a year and look at local and national developments. They are able to feedback to the regional representative of the NNPCF (National Network of Parent Carer Forums) and the Regional Adviser from national charity Contact. There are two key national partners for HPCI.